You already know how annoying it is to see bugs, dirt, ice, tree saps etc. stuck on to your windshield, hindering your on-road visibility. But, if you have the best windshield washer fluid for the condition, you don’t even know what these problems are. Some of us might think normal water can also do the job. But, it is not as effective as these highly effective washer fluids. Windshield washer fluids help in cleaning your car’s windshield. They are made for particular conditions like winter, dirt, tree saps etc. Have you heard about Legionnaire’s disease? If not, you should. There is a direct relationship between Legionnaires’ disease and usage of normal water for wiper (More on this later!). I hope that you now have a fair idea of how important it is to have the best wiper fluid for your car. 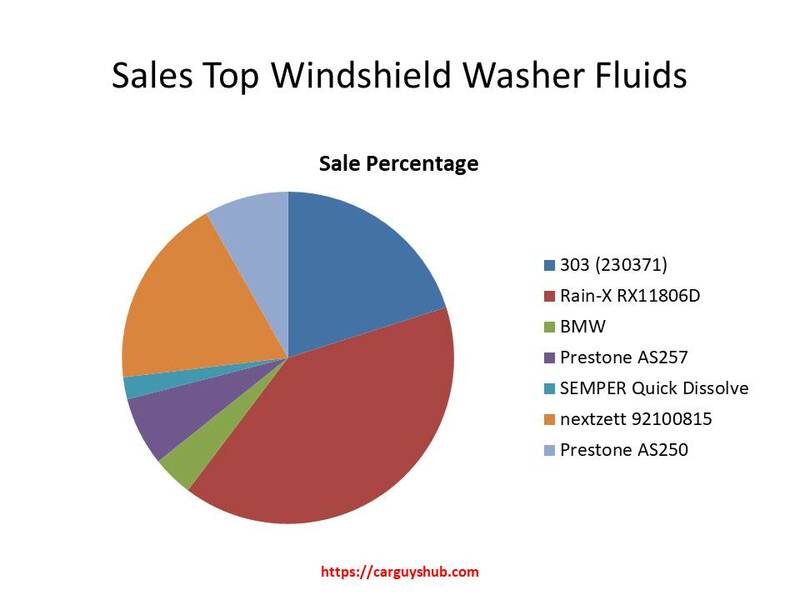 If so, let me introduce you our top picks before going to the windshield washer fluid reviews. The best way to choose a product for your purpose is by carrying out a market analysis. You don’t have to waste your valuable time doing it. We have done it for you. Below is a graphical representation on how these windshield washer fluids are bought in the market. Customer satisfaction is another key thing to note while buying something. It gives a good indication on how good the products are. We have seen some of the reasons we should try to buy and use windshield washers for our cars. But that’s not all! The best Car windshield cleaning tool: It is very common that the windshields of almost all the vehicles get dirty by the presence of bugs, dirt, grease, tree saps etc. This is more frequent when you drive faster and you need to clean it. 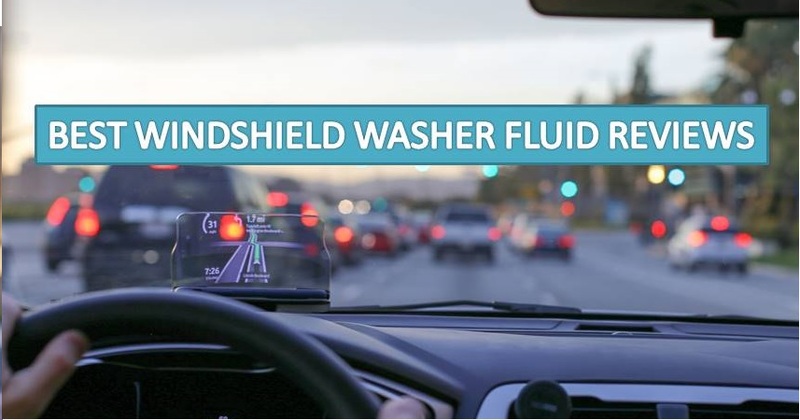 To avoid smears on your car windshield: These fluids are highly effective and make it sure that the wiping action doesn’t produce any scratches on windshield. For longer life of the wiper: Your wiper will get damaged if you use water in your reservoir for a longer duration. Legionnaires’ disease: A study by UK’s Health Protection Agency revealed that usage of normal water as wiper fluid will cause Legionnaires’ disease. This is a form of pneumonia which will last around two weeks’ time when exposed to aerosolized bacteria from infected water. Now that we have seen the importance of windshield washer fluids for your car, let us get into the real business. We have reviewed the top 7 of these washer fluids below. How did we come up with this list? We made a thorough site survey first to bring out the probable winners. Then we tested these top products to make sure that they are the best. It was bit hard for us to rule out some of the top quality products from the list as our final seven were outclassing them. With 3 times the power of ordinary washers, this one is great to have windshield washer fluid. Easy to use and space and money saving, it’s the best buy windshield washer fluid. 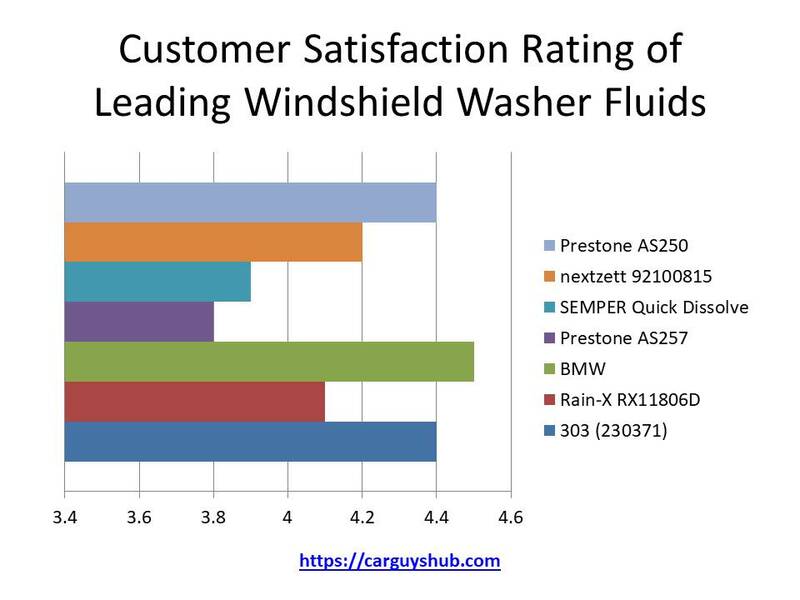 Even we were bit surprised to find that the best windshield washer fluid as per our surveys is not a ‘fluid’ as such. The 303 (230371) is a tablet pack which has to be dissolved in water to use as a washer fluid. With 1 tablet, you can make 1 gallon of top quality washer fluid for your car. The tablets are super concentrated with three times the power of normal cleaners. It is highly effective on bugs, road film, dirt, and grime. For the best performance, we would advise you to use clean distilled water to avoid any floaters while making the fluid. This is not designed for winter use. But, if you add it to winter fluids, you’re going to witness the great upgraded performance. The best thing about this product is that you don’t need much space to carry it around. This is very helpful for people who’re traveling a lot through roads with bugs and dirt. You don’t know when you need to have a proper wash of your car windshield. You can easily store few of these tablets; say 5, in your vehicle and use when needed. The environmental benefits it offers to take it one step ahead of all other products on our list. It comes in different packages – packets of five, 25 etc. We recommend you to buy the 25 tablet packet for one full year usage. A great money-saving option, 303 (230371) has stolen the heart of many with its ease of usage and performance. It is one among the most bought windshield washer products and is the best rated one. Like thousands of happy customers, you will also love using this one. Without any doubt, Rain-X RX11806D is the most bought one in the market. Rain-X is known for producing top quality products and this one is no different. 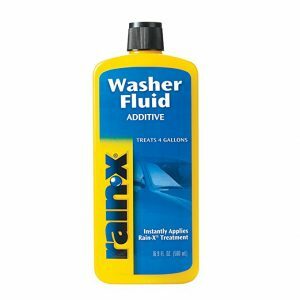 It was a bit hard for us to place Rain-X RX11806D in the second spot, considering the number of persons use this awesome washer fluid. But there can only be one winner. However, there are certain areas in which Rain-X RX11806D is ahead of 303 tablets. If you are looking for the best winter windshield washer fluid, then this one is the winner. The usage is easy. You just need to add the additive to your existing washer fluid and you’re ready to go. Rain-X RX11806D is the most bought product, as per our survey. The fact that more than 90% of the users have loved this product shows its effectiveness. If you’re planning to buy a winter windshield washer fluid which also can be used against dirt, dust and grease, don’t think twice! 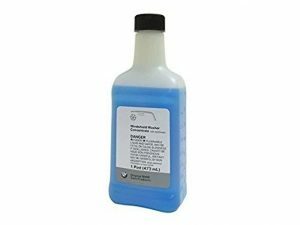 Though the washer fluid concentrate looks like any normal product, it is the best wiper fluid for BMW. Yeah, it is a BMW recommended one. It is a good idea to have this one for your BMW, rather than going for some cheaper options. There are many occasions in which we have heard complaints from BMW owners on their washer pump getting sticky and stops working when they used low-quality windshield washer fluids. So, if you love your vehicle, it’s a great idea to go with this product. Another great aspect of this BMW product is that it is odorless. Most of the windshield washers available in the market produce some sort of smells and that may be an issue for at least some of us. But it will never happen with this one. We advise you to follow the recommended dilutions as prescribed in their manuals for different temperatures. Although the instructions are very clear, people sometimes fail to follow it and make a mess out of it. You don’t want to end up like that. Although it’s mostly used in BMW vehicles, it is having very good customer ratings. The trust they show on this product itself gives an idea of how good it is. Definitely worth trying; especially for BMW vehicles. Don’t take chance with other windshield fluids. If bugs and tree saps are your main concern, then Prestone AS257 is the best windshield washing Fluid for you. You don’t have to think about ratios and proportions with this washer. It’s already diluted and ready to use. It comes in a large volume of 1 gallon. The fresh citrus scent gives a feeling of cleanliness. It might be a little bit intimidating for those who don’t like strong smells. You should know that Prestone AS257 is not designed to use in sub-freezing temperatures. So, it is better not to go with this product if you live in cold areas. However, the brand has a solution for you. 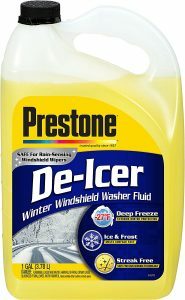 Prestone’s Washer Fluid Booster De-Icer Additive is a nice solution you can add with the washer fluid to use in winter. For more effectiveness, you should leave the fluid on your windshield for a while so that it gets a chance to penetrate through the dirt. Many customers have found this very helpful; they were thinking the mix was not so good. But once they started giving some time for it to penetrate, the results were outstanding. Prestone has a number of a nice array of windshield washer fluids. We were not able to add all of them in this list. 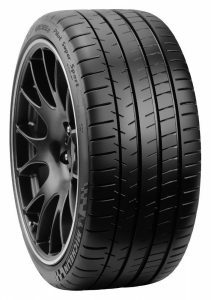 The other variants you can try are Prestone AS657, Prestone AS259 etc. Convenient and highly effective, this premium concentrated cleaning powder is one of the most affordable ones to have for your car. Easy to use and cheap, you can grab this one at an attractive rate. 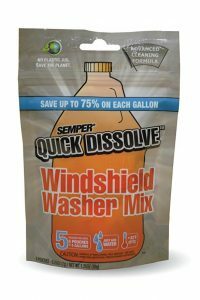 SEMPER Quick Dissolve is a performance-oriented windshield washer you can use without any troubles. The best thing about this washer fluid mix is that it comes ready; you just need to add water and use it at your whim. The product works best for removing bugs and road grime. Each packet contains five pouches and each of the pouches can be used for one full reservoir. You can easily use it for more than six months at the least. Yes, you’re thinking it right; it is better to have this one rather than storing 1-gallon jugs of readymade washer fluids. How do you use it? This is very easy to use. You don’t have to think about any proportions. Just add the contents in the pouch to your washer tank and fill it with water. You’re set to go. Very easy and convenient, isn’t it? That’s one of the main reason we have included SEMPER Quick dissolve in this list. A word of caution to those who’re planning to use this for winter; this is not your product. But, you can add this to a non-freezing solution for better premium results. Another interesting thing about this windshield washer is that it saves up to 75% on each gallon. This is what the manufacturer claims and 99% of the customers agree with this. The same goes for space also. Since you have the liberty to use this concentrated powder only when required, it is a space saver. People who have an affinity towards environmental products should try this one out. This is ‘green’ product helps in reducing 99% of carbon contents compared to 1 gallon of normal windshield washer fluid. If you’re looking for a cost-effective solution for windshield washing, SEMPER Quick dissolve definitely qualifies. In fact, it works great to get rid of road grime and bug guts. The easy to store windshield washing fluid is definitely worth buying if you’re short of space. nextzett 92100815 is another great product you can use against bugs and specks of dirt. The quick action makes it one of the best windshield washers in the world. You will be amazed to hear the concentration level of the mixer. Compared to the normal readymade washer fluids, this one is 200 times more concentrated. That means each pack of 8.5 oz can make up to 12 gallons cleaning fluid. Although it’s not that hard to mix the concentrated fluid with water, we suggest you not to make a mess out of it. You can mix .5 oz of the fluid with .75 gallons of regular water. There are many customers who say distilled water is a better option than normal tap water. Another prestigious product from Prestone, AS250 is a quick and efficient deicer you should buy if you are looking to buy washer fluid for winter. 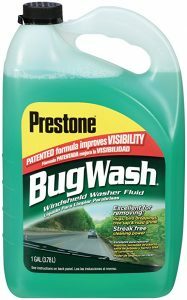 The next product in our top windshield washer fluid is also from Prestone. Prestone is a brand known for producing quality products and so is this one too. When compared with others, the AS250 is a de-icer which is designed to work faster on ice and frost. You will be amazed by the way it works so quickly and efficiently. The de-icer making the frosts and ices melting is a soothing scene to watch. Doesn’t make streaks on your windshield. This is a must to have product if you’re living in a cold climate. When you’re in a hurry, get this product for the best result. The customers who used this product say this is the only windshield washer they will use during winter. That says it all! To be frank, there is not much to think when buying a windshield washer. You can easily get the best windshield cleaner with some idea on the condition you live in and available product.s Apart from the different types of these washer fluids available in the market, there is nothing much to separate them. The concentration, components etc are of the same. Said that selecting the washer fluid is your choice and your weather condition has a key role to play. In fact, you should buy that product which is best suitable for the climate in you live in. These handy fluids are available in different types – tablet, full solution, and additives. The choice of the type entirely depends upon you. What are the criteria at which you chose a windshield washer fluid? Look for your comfort. That’s the most important thing. Apart from the comfort factor, there is not much to distinguish between them. So, how do you select your desired type? For that, we will go through each of the above-mentioned types and see how they are used. Tablet: As the name suggests, they come in the form of tablets. That means you will get abundant storage space. They are very cheap to use. These tablets are highly concentrated. To use them, you need to mix the tablet with water. That’s a fairly easy step and most of the tablets are to be mixed with 1 gallon of water. Liquid Concentrated Solutions: Compared to the tablets, these come in liquid form. They are highly concentrated and again you need to mix it water. The thing with this category is that you need to be aware of the dilution ration. If you fail to follow the dilution ratio, you might mess up things. Windshield Additives: Most of the washer fluids available are actually additives. So don’t get confused by the name. You need to add these additives in water to use them. I think all these are self explanatory and there is no need to explain this to you. Yeah, choose the one which issuitable for you. We have given a detailed reviews of all the best ones among the above types. I’m damn sure you will find one which is suitable for your condition in our reviews. Conclusion: Did You Get the Best Windshield Cleaner? With that, you’re good to go and you will never have any issue with your windhsield wipers. I hope you like our best washer fluid reviews. Get clean and streak-free windshields using our recommended products. Car Guys Hub is a participant in the Amazon Services LLC Associates Program, an affiliate advertising program designed to provide a means for website owners to earn advertising fees by advertising and linking to amazon(.com, .co.uk, .ca etc) and any other website that may be affiliated with Amazon Service LLC Associates Program.